In healthy humans, cerebral oxygen desaturation during exercise affects motor unit recruitment, while oxygen supplementation enhances cerebral oxygenation and work capacity. It remains unknown whether in patients with chronic obstructive pulmonary disease (COPD), the well-documented improvement in exercise tolerance with oxygen supplementation may also be partly due to the increase in cerebral oxygenation. Using near infrared spectroscopy, we measured both frontal cerebral cortex blood flow (CBF) using indocyanine green dye and cerebrovascular oxygen saturation (St,O2) in 12 COPD patients during constant-load exercise to exhaustion at 75% of peak capacity. Subjects exercised while breathing air, 100% oxygen or normoxic heliox, the latter two in balanced order. Time to exhaustion while breathing air was less than for either oxygen or heliox (mean±sem 394±35 versus 670±43 and 637±46 s, respectively). Under each condition, CBF increased from rest to exhaustion. At exhaustion, CBF was higher while breathing air and heliox than oxygen (30.9±2.3 and 31.3±3.5 versus 26.6±3.2 mL·min−1 per 100 g, respectively), compensating for the lower arterial oxygen content (Ca,O2) in air and heliox, and leading to similar cerebral cortex oxygen delivery (CQO2 for air was 5.3±0.4, for oxygen was 5.5±0.6 and for heliox was 5.6±1.0 mL O2 per min per 100 g). In contrast, end-exercise St,O2 was greater while breathing oxygen compared with air or heliox (67±4 versus 57±3 and 53±3%, respectively), reflecting Ca,O2 rather than CQO2. Prolonged time to exhaustion by breathing oxygen and heliox, despite these having a similar CQO2 to air, a lower St,O2 with heliox than oxygen, and yet similar endurance time and similar St,O2 in air and heliox despite greater endurance with heliox, do not support the hypothesis that an improvement in cerebral cortex oxygen availability plays a contributing role in increasing exercise capacity with oxygen or heliox in patients with COPD. In patients with chronic obstructive pulmonary disease (COPD), exercise intolerance is multifactorial , involving respiratory-mechanical , pulmonary gas exchange , haemodynamic  and peripheral muscle abnormalities . These abnormalities may ultimately prevent adequate oxygen transfer from the atmosphere to, and/or utilisation of oxygen by, the mitochondria . The importance of reduced arterial oxygen transport as a factor limiting exercise tolerance in COPD patients has been illustrated by studies where supplemental oxygen prevented exercise-induced arterial hypoxaemia, reduced ventilatory requirement and dyspnoea sensations, and improved leg muscle oxygen delivery and utilisation, thereby enhancing exercise tolerance [7–9]. Studies in healthy subjects have shown that reduction in cerebral oxygenation, secondary to arterial hypoxaemia, may play a role in the subject's decision to terminate exercise in hypoxia [10–13]. In this context, a recent study by our group in healthy subjects revealed that during maximal hypoxic exercise, frontal cerebral cortex blood flow (CBF) was insufficient to offset the lower arterial oxygen content and, as such, at exercise exhaustion frontal cerebral cortex oxygen delivery (CQO2) was lower compared with normoxia . These findings were taken to indicate that a critical reduction in CQO2 in hypoxia compared with normoxia could constitute the signal limiting exercise performance, because cerebral oxygen desaturation during exercise is known to affect motor unit recruitment, while oxygen supplementation enhances cerebral oxygenation and work capacity . Oxygen supplementation is also known to enhance exercise capacity in patients with COPD [7, 16]. Enhanced exercise performance has been attributed to the alleviation of ventilatory constraints, improved oxygen delivery to locomotor muscles and reduced perceptions of breathlessness and leg discomfort [1–5]. Whether improvement in exercise tolerance with oxygen supplementation in patients with COPD may also be partly due to the increase in cerebral oxygenation  currently remains unknown. Accordingly, the present study aimed to investigate whether oxygen supplementation substantially improves CQO2, thus potentially constituting a contributing factor to enhanced exercise capacity in COPD. We applied two methods known to increase exercise tolerance by increasing systemic oxygen delivery in COPD, i.e. pure oxygen supplementation [7–9] and normoxic heliox breathing [17–19]. The former increases oxygen delivery mainly by increasing arterial oxygen content , whereas the latter does so mainly by improving blood flow [18, 19]. It was reasoned that if, at exhaustion of exercise while breathing room air, CQO2 was significantly lower compared with that while breathing pure oxygen or normoxic heliox, this would suggest that, as in healthy subjects , an improvement in cerebral cortex oxygen availability may play a contributing role in increasing exercise capacity in patients with COPD. 12 patients with clinically stable COPD participated in the study according to the following inclusion criteria: 1) a post-bronchodilator forced expiratory volume in 1 s (FEV1) <60% predicted without significant reversibility (<12% change of the initial FEV1 value or <200 mL); 2) optimal medical therapy according to Global Initiative for Chronic Obstructive Lung Disease (GOLD)  and 3) moderate hypoxaemia (arterial blood oxygen saturation <93% but >84%) in room air during preliminary exercise testing. Exclusion criteria included clinically manifest cor pulmonale, cardiovascular illness, musculoskeletal abnormalities or other diseases that could contribute to exercise limitation. The study was approved by the University Evangelismos Hospital Ethics Committee and was conducted in accordance with the guidelines of the Declaration of Helsinki. Prior to participation in the study, all patients gave written, signed, informed consent. Experiments were conducted in two visits. During visit 1, patients performed a preliminary incremental exercise test to the limit of tolerance while breathing room air (peak work rate (WRpeak)) to establish the work rate corresponding to 75% of peak. During visit 2, patients underwent three constant-load exercise tests at 75% WRpeak to the limit of tolerance (i.e. exhaustion), initially breathing room air and then breathing in a balanced sequence of either pure oxygen or normoxic heliox (replacement of inspired nitrogen by helium). The three exercise tests during visit 2 were separated by 120 min of rest. During constant-load exercise, CBF (assessed by near-infrared spectroscopy (NIRS) using the light-absorbing tracer indocyanine green (ICG) dye), as well as cardiac output (also assessed by ICG dye dilution) , were measured at rest and at the limit of tolerance (online supplementary material). As endurance time was expected to be significantly prolonged while breathing either pure oxygen or normoxic heliox [7–9, 17–19], measurements during these trials were also performed at the time-point where exercise in room air was terminated (i.e. at isotime) in order to detect whether potential differences in CQO2 at isotime could, in part, explain differences in endurance time while breathing oxygen or heliox. NIRS was also used to continuously record frontal cortex cerebrovascular oxygen saturation (St,O2) as an indication of cerebral cortical oxygen availability (online supplementary material) [12–14]. During visit 2, subjects were prepared with catheters inserted using local anaesthaesia and sterile technique into the right radial artery and forearm vein. The catheters were used to collect blood samples and to inject ICG and sample blood after each injection for cardiac output measurements (online supplementary material). Cardiac output was determined by the dye dilution method, using known volumes of ICG (1.0 mL at 5 mg·mL−1) injected into the right forearm vein followed by a rapid 10-mL flush of isotonic saline. Blood was withdrawn from the right radial artery using an automated pump (Harvard Apparatus, Holliston, MA, USA) at 20 mL·min−1 through a linear photodensitometer (Pulsion ICG; ViCare Medical, Birkerod, Denmark) connected to a cardiac output computer (Waters CO-10; Waters, Rochester, MN, USA) through a closed-loop, sterile tubing system, as described and referenced in detail in the online supplementary material. To measure CBF, one set of NIRS optodes was placed on the skin over the left frontal cortex region of the forehead, secured using double-sided adhesive tape. A special net headset was used to hold the NIRS probe firmly attached over the frontal cortex region. The optode separation distance was 4 cm, corresponding to a penetration depth of ∼2 cm. Optodes were connected to a NIRO 200 spectrophotometer (Hamamatsu Photonics KK, Hamamatsu, Japan), which was used to measure ICG concentration following the same 5-mg bolus injection of ICG in the right forearm vein used for cardiac output assessment, as described in detail in the online supplementary material. St,O2 was assessed continuously throughout the whole testing period by the same NIRO 200 spectrophotometer as used for the measurement of CBF and described in detail in the online supplementary material. Arterial oxygen tension (Pa,O2) and arterial carbon dioxide tension (Pa,CO2), pH, haemoglobin concentration and arterial oxygen saturation (Sa,O2) were measured from 2-mL blood samples using a blood gas analyser combined with a co-oximeter (ABL 625; Radiometer, Copenhagen, Denmark) within a few seconds of collection. Arterial oxygen content (Ca,O2) was computed using the formula (Ca,O2=(1.34×Hb×Sa,O2)+(0.003×Pa,O2)), where Hb is haemoglobin. Data are presented as mean±sem, unless otherwise stated. Sample size capable of detecting between-condition (i.e. room air, and pure oxygen) difference of 20% was estimated for the change in CQO2 at exhaustion using the standard deviations from our previous study in healthy subjects . The minimum sample size was calculated to be 10 patients based on 80% power, and a two-sided value of 0.05 was considered to be significant. One-way ANOVA with repeated measures was used to identify statistically significant differences across the three exercise tests at isotime or at exhaustion, and across different time-points (rest, isotime and exhaustion) within each constant-load exercise test. When ANOVA detected statistical significance, pair-wise differences were identified using Tukey's honestly significant difference post hoc procedure. The level of significance was set at p<0.05. Patients had moderate-to-severe airway obstruction with increased static lung volumes, substantial reductions in carbon monoxide diffusion capacity and moderately reduced resting Pa,O2 (table 1). Three patients were GOLD stage II, six were GOLD stage III, and the remaining three were GOLD stage IV. Subjects exhibited reduced maximal exercise capacity with moderate haemoglobin desaturation (table 2). During constant-load exercise at 75% WRpeak, time to exhaustion while breathing air was less than for oxygen or heliox (mean±sem 394±35 versus 670±43 and 637±46 s, respectively; p<0.001 for both) (table 3). Cardiac output was similar at rest during room air, oxygen or heliox breathing, and during exercise increased from rest in all three conditions (p<0.001). Cardiac output was greater at exhaustion during exercise in air (p=0.04) and at isotime breathing heliox (p=0.04) compared with isotime while breathing pure oxygen. However, cardiac output at exhaustion did not differ between air, oxygen or heliox breathing (fig. 1a). At rest, Ca,O2 was lower in room air compared with oxygen (p<0.001) and heliox breathing (p=0.01), and it was lower during heliox compared with pure oxygen breathing (p<0.001). During exercise, Ca,O2 did not change from rest while breathing pure oxygen, whereas it decreased compared with rest during room air and heliox breathing (p<0.05). Ca,O2 was lower at exhaustion in air compared with isotime during both oxygen (p<0.001) and heliox breathing (p=0.01); at this isotime, Ca,O2 was lower during heliox compared with oxygen breathing (p<0.001). Furthermore, at exhaustion, Ca,O2 was lower in air compared with oxygen (p<0.001) and heliox (p=0.01), and it remained lower while breathing heliox compared with oxygen breathing (p<0.001) (fig. 1b). 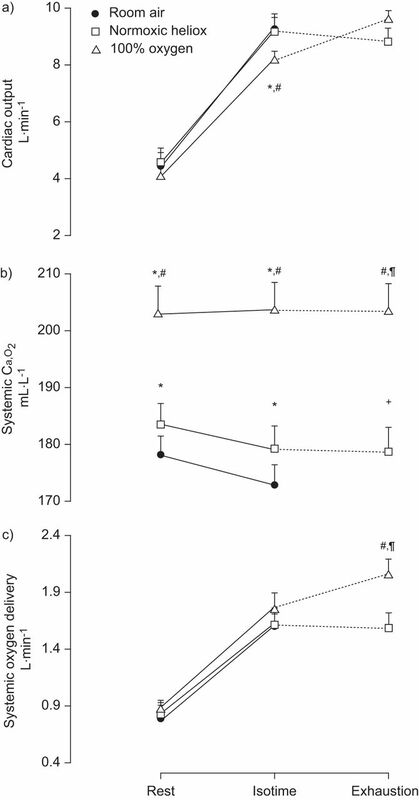 Systemic oxygen delivery was similar at rest during room air, oxygen or heliox breathing, and during exercise increased from rest in all three conditions (p<0.001). Systemic oxygen delivery did not differ across the three conditions at isotime; however, at exhaustion, systemic oxygen delivery was greater (p=0.002) in oxygen compared with both air and heliox breathing (fig. 1c). Central haemodynamic responses. a) Cardiac output, b) arterial oxygen content (Ca,O2) and c) systemic oxygen delivery recorded at rest, at the time of exhaustion in room air (isotime) and at the limit of exercise tolerance (exhaustion) while breathing room air, normoxic heliox or 100% oxygen. Values are mean±sem for 12 subjects. Isotime data are those obtained on normoxic heliox and 100% oxygen at the same time as at exhaustion on room air. *: p<0.05 compared with room air; #: p<0.05 compared with normoxic heliox; ¶: p<0.05 compared with exhaustion in room air, all at the same time point of exercise. Significant differences between data at isotime or exhaustion and rest are not indicated on the figure. CBF was similar at rest in room air, oxygen and heliox, and significantly increased from rest across all three conditions (p<0.001). CBF was greater at exhaustion in air (p=0.03) and at isotime while breathing heliox (p=0.02) compared with isotime while breathing oxygen. Similarly, at exhaustion, CBF in oxygen was lower than in heliox (p=0.03) and air (p=0.04) breathing (fig. 2a). CQO2 was similar at rest in air, oxygen and heliox, and increased during exercise in all three conditions (p<0.001). CQO2 values, compared at either at isotime or at exhaustion, were not different for air, oxygen or heliox (fig. 2b). Frontal cortex cerebrovascular oxygenation and haemodynamic responses. a) Frontal cerebral cortex blood flow, b) frontal cerebral cortex oxygen delivery and c) frontal cortex cerebrovascular oxygen saturation (St,O2) recorded at rest, at the time of exhaustion in room air (isotime) and at the limit of exercise tolerance (exhaustion) while breathing room air, normoxic heliox or 100% oxygen. Values are mean±sem for 12 subjects. Isotime data are those obtained on normoxic heliox and 100% oxygen at the same time as at exhaustion on room air. *: p<0.05 compared with room air; #: p<0.05 compared with normoxic heliox; ¶: p<0.05 compared with exhaustion in room air, all at the same time point of exercise. Significant differences between data at isotime or exhaustion and rest are not indicated on the figure. At rest, frontal cortex cerebrovascular oxygenation, as expressed by St,O2, was lower in air (p=0.02) and heliox (p=0.003) than in oxygen. During exercise, St,O2 did not change from rest while breathing air or heliox, but increased with oxygen (p=0.004). St,O2 was lower at exhaustion in air and at isotime during heliox breathing than at isotime breathing oxygen (p<0.001 for both). Furthermore, at exhaustion, St,O2 in air was lower compared with oxygen (p<0.001) and higher compared with heliox (p=0.04); St,O2 during heliox was also lower compared with pure oxygen breathing (p<0.001) (fig. 2c). Pa,O2, Pa,CO2 and Sa,O2 were higher while pH were all lower (p<0.05) in pure oxygen compared with air and heliox breathing at both isotime and exhaustion (table 3). Dyspnoea at exhaustion on air was greater compared with isotime during exercise on either heliox (p=0.04) or oxygen (p=0.007). Similarly, at exhaustion on air, leg discomfort was greater compared with isotime on oxygen (p=0.03). In healthy humans, cerebral desaturation during exercise is known to affect the recruitment of those motor neurones controlling the slow-twitch muscle fibre population that is responsible for performing submaximal work tasks . In this regard, besides known pathophysiological factors that limit exercise tolerance in COPD, i.e. 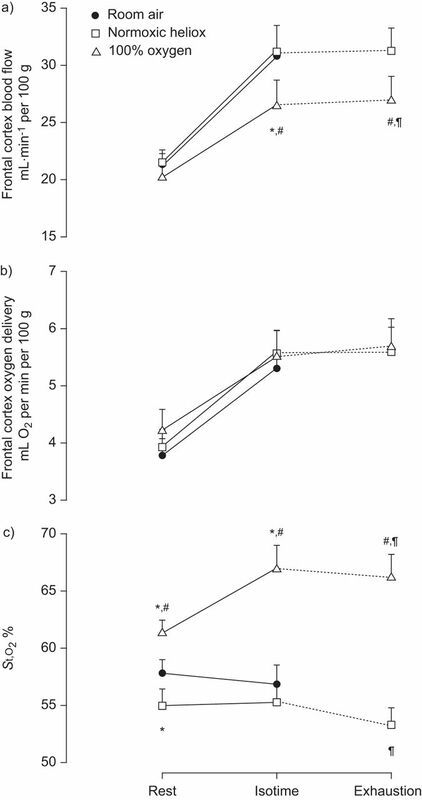 ventilatory restriction, reduced oxygen delivery to respiratory and peripheral muscles and locomotor muscle dysfunction [2–5], which ultimately lead to intense sensations of dyspnoea and leg discomfort, exercise limitation in COPD might be directly affected by the inability of the brain to maintain a given motor output consequent to a reduction in its mitochondrial oxygen tension . Such a possibility appears plausible when considering that oxygen supplementation enhances both cerebral oxygenation and work capacity in healthy humans  and exercise capacity in patients with COPD [7, 16]. In order to test this possibility, we specifically designed and conducted the present study, which was independent of our previous endeavours, to explore peripheral and respiratory muscle blood flow  by applying two methods known to increase both exercise tolerance and systemic oxygen delivery in COPD: 1) oxygen administration [7–9], to increase arterial oxygen content; and 2) administration of normoxic heliox, which has recently been shown to increase peripheral blood flow during exercise in COPD [18, 19]. Along these lines, it was reasoned that if at exhaustion while breathing room air, CQO2 was significantly lower compared with that while breathing pure oxygen or normoxic heliox, this would suggest that, as in healthy subjects , an improvement in cerebral cortex oxygen availability may play a contributing role in enhancing exercise capacity in patients with COPD. Three major outcomes from the present study, however, suggest the opposite, i.e. that endurance time in COPD patients is not associated with limited cerebral oxygen transport or availability. First, CQO2 at isotime or at exhaustion was not different among air, oxygen and heliox, although the latter inspirates supported much longer times to exhaustion. Secondly, St,O2 was higher on oxygen than heliox yet endurance times were similar. Thirdly, St,O2 was similar on breathing air and heliox, yet the latter supported a much longer endurance time. The most likely limitations for exercise tolerance in room air were the intense sensations of dyspnoea and leg discomfort consequent to exercise-induced dynamic hyperinflation [2, 8, 16] and limitation in peripheral muscle oxygen delivery and/or peripheral muscle dysfunction [5, 7, 19, 21], respectively. The expected reduction in the degree of exercise-induced dynamic hyperinflation and enhanced peripheral muscle oxygen delivery by oxygen and heliox most probably alleviated dyspnoea sensations and leg discomfort, respectively (table 3) [7, 18, 19]. Lack of significant differences in CQO2 at exhaustion in air, oxygen and heliox could be attributed to CBF differences (fig. 2), compensating for the changes in Ca,O2 under each condition (fig. 1). Increased CBF in air was most probably due to cerebral vasodilatation previously documented to occur during graded reduction in Sa,O2 in hypoxic exercise in healthy individuals . Indeed, at exhaustion in air, Pa,O2 and Sa,O2 fell to 67±4 mmHg and 89±2%, respectively (table 3). Therefore, our findings most probably concur with those in healthy subjects in that during high-intensity exercise, the vasodilator influence of hypoxia leads to hypoxia-induced changes in cerebral autoregulation and sympathetic nerve activity . However, it is likely that the effect of hypoxia on measures of CQO2 and St,O2 might have been greater had subjects exhibiting greater and clinically significant desaturation been studied. Another important factor that may have contributed to maintaining greater CBF in room air and heliox as compared with isotime during exercise with oxygen could be the greater increase in cardiac output with exercise in both room air and heliox (fig. 1). The greater increase in cardiac output in both conditions in which patients breathed normoxic gas mixtures was probably due to previously reported hypoxic sympathetic stimulation in an attempt to preserve systemic oxygen delivery [23–26]. Additional evidence that CQO2 does not constitute the signal to curtail exercise in COPD patients is provided by the findings of heliox breathing, which, as in the case of oxygen, also prolonged exercise endurance time, while CQO2 at both isotime and at the point of exhaustion was identical to that at exhaustion in room air. Heliox allowed exercise-induced arterial haemoglobin desaturation almost in the same way that air does (Sa,O2 91±2%; table 3) but, at the same time enhanced systemic oxygen delivery through an increase in cardiac output. Although Ca,O2 decreased during heliox breathing exercise, CBF was highly comparable with that at exercise termination in room air, thereby compensating for decreased Ca,O2 and ensuring identical CQO2 at isotime and at the point of exhaustion as with pure oxygen breathing. Cerebral cortex haemodynamic responses during exercise in patients with COPD are different compared with those in healthy subjects recently reported by our group  in that CBF at the limit of tolerance in COPD patients was maintained at significantly greater levels compared with resting conditions, while in hypoxaemic healthy individuals at the limit of tolerance, CBF declined towards baseline. The latter was attributed to the significant reduction in Pa,CO2 secondary to hyperventilation, most probably causing cerebral vascular vasoconstriction. In contrast with healthy individuals, COPD patients in the present study demonstrated relative hypoventilation during exercise reflected by elevated Pa,CO2 levels compared with rest (tables 1 and 3), which if anything would have facilitated cerebral vascular vasodilation [10, 27]. A finding of the present study is dissociation between CQO2 and cerebrovascular oxygen saturation, as expressed by St,O2, which is often taken to reflect cerebral oxygen availability during exercise [10, 12, 13, 15, 20]. Accordingly, at exhaustion in air, St,O2 was significantly lower than at isotime during oxygen, whereas CQO2 was nearly identical. The reason for this disparity between cerebrovascular oxygen saturation and CQO2 is that measurements of St,O2 by NIRS yield oxygen saturation readings of all the blood in the brain within the optode field of view, i.e. arterial, capillary and venous. The value recorded depends on oxygen saturation of all vessels within the field of view in proportion to their relative volume, and as such it is highly dependent on Sa,O2 [28, 29]. Hence, cerebrovascular oxygen saturation assessed by NIRS [10, 12, 13] reflects not only the balance between CQO2 and utilisation, but also the effects of hypoxia- and exercise-induced arterial haemoglobin oxygen desaturation . Accordingly, interpreting St,O2 alone cannot accurately explain whether high values differ from low values because of arterial saturation differences or because of blood flow differences. In addition, St,O2 values cannot be compared between different groups of COPD patients as these values rather reflect different brain oxygenation states when arterial saturation is different between groups. Nevertheless, our findings are consistent with those of Jensen et al. , who demonstrated that cerebrovascular oxygen saturation was improved during hyperoxic compared with atmospheric exercise in patients with COPD. However, in the study by Jensen et al. , the exercise-induced increase in cerebral total haemoglobin concentration (taken as an index of blood volume) was not affected by hyperoxia, whereas in the present study, the increase in CBF from rest to exercise was lower in hyperoxia compared with normoxia. The lack of greater improvement in CBF during exercise with administered oxygen might be due to the fact that an increase in Pa,O2 by inhalation of a hyperoxic gas has been demonstrated to induce direct vasoconstrictive effects in arterioles, thereby reducing cerebral blood flow . CQO2 measurements were performed using optodes affixed over the pre-frontal cortex region of the forehead because it has been shown, at least in healthy subjects , that in hypoxia, the magnitude of changes in cerebrovascular oxygenation indices is greater in pre-frontal than in pre-motor and motor cortex regions. In addition, the pattern of blood flow responses to intense exercise could be different among brain regions, as indicated by studies measuring blood flow in the internal carotid and vertebral arteries in humans . Thus, the “true” global brain response might not necessarily mirror the local responses investigated here in the left frontal region of the forehead. Furthermore, similar optode placement allows the results of the present study in COPD to be compared with those in healthy fit subjects . The peak increase from rest in cerebral blood flow in healthy subjects who become hypoxaemic during exercise while breathing a hypoxic gas mixture (∼30%)  is very similar to that reported in the present study (∼28%) in patients with COPD becoming mildly hypoxaemic while breathing a normoxic gas mixture. This finding highlights once more the importance of cerebral autoregulation in maintaining cerebral blood flow and, thus, cerebral oxygen supply in tandem with the increased metabolism during hypoxaemic exercise, which becomes highly dependent on an enhanced gradient for oxygen diffusion . In conclusion, the results of the present study show dissociation between cerebral oxygen delivery or cerebrovascular oxygen saturation and time to exhaustion uncovered by comparing endurance using three different inspired gases, air, normoxic heliox and 100% oxygen. Although future studies engaging larger sample size are certainly necessary, the present findings do not support the hypothesis that an improvement in cerebral cortex oxygen availability plays a contributing role in enhancing exercise capacity in patients with COPD. This work was supported by Thorax Foundation and by grants from the “A. Perotti” visiting Professorship fund of the Thorax Foundation.
. Exercise limitation and clinical exercise testing in chronic obstructive pulmonary disease. Clin Chest Med 1994; 15: 305–326.
. Gas exchange during exercise in mild chronic obstructive pulmonary disease. Correlation with lung structure. Am Rev Respir Dis 1991; 144: 520–525.
. Right ventricular performance and central circulatory hemodynamics during upright exercise in patients with chronic obstructive pulmonary disease. Am Rev Respir Dis 1984; 130: 722–729.
. The major limitation to exercise performance in COPD is lower limb muscle dysfunction. J Appl Physiol 2008; 105: 751–753.
. Determinants of maximal oxygen transport and utilization. Annu Rev Physiol 1996; 58: 21–50.
. Effects of oxygen on lower limb blood flow and oxygen uptake during exercise in COPD. Med Sci Sports Exerc 2001; 33: 916–922.
. Effects of hyperoxia on ventilatory limitation during exercise in advanced chronic obstructive pulmonary disease. Am J Respir Crit Care Med 2001; 163: 892–898.
. Evidence of skeletal muscle metabolic reserve during whole body exercise in patients with chronic obstructive pulmonary disease. Am J Respir Crit Care Med 1999; 159: 881–885.
. Effect of exercise on cerebral perfusion in humans at high altitude. J Appl Physiol 2005; 99: 699–706.
. Enhanced cerebral CO2 reactivity during strenuous exercise in man. Eur J Appl Physiol 2006; 96: 299–304.
. Effects of acute hypoxia on cerebral and muscle oxygenation during incremental exercise. J Appl Physiol 2007; 103: 177–183.
. Frontal and motor cortex oxygenation during maximal exercise in normoxia and hypoxia. J Appl Physiol 2009; 106: 1153–1158.
. Frontal cerebral cortex blood flow, oxygen delivery and oxygenation during normoxic and hypoxic exercise in athletes. J Physiol 2011; 589: 4027–4039.
. Cerebral blood flow and metabolism during exercise: Implications for fatigue. J Appl Physiol 2008; 104: 306–314.
. Factors contributing to relief of exertional breathlessness during hyperoxia in chronic airflow limitation. Am J Respir Crit Care Med 1997; 155: 530–535.
. Effect of Heliox on lung dynamic hyperinflation, dyspnea, and exercise endurance capacity in COPD patients. J Appl Physiol 2004; 85: 1637–1642.
. Effect of helium breathing on intercostal and quadriceps muscle blood flow during exercise in COPD patients. Am J Physiol Regul Integr Comp Physiol 2011; 300: R1549–R1559.
. Heliox improves oxygen delivery and utilization during dynamic exercise in patients with chronic obstructive pulmonary disease. Am J Respir Crit Care Med 2009; 179: 1004–1010.
. Cerebral desaturation during exercise reversed by O2 supplementation. Am J Physiol 1999; 277: H1045–H1052. Global Initiative for Chronic Obstructive Lung Disease: Global strategy for the diagnosis management, and prevention of chronic obstructive pulmonary disease Executive summary, 2005. www.goldcopd.org/Guidelines/guideline-executive-summary%3a-global-strategy-for-the-diagnosis%2c-management%2c-and-prevention-of-copd.html Date last accessed: November 27, 2012.
. Thresholds for hypoxic cerebral vasodilation in volunteers. Anesth Analg 1997; 85: 817–820.
. Dynamic cerebral autoregulation during exhaustive exercise in humans. Am J Physiol Heart Circ Physiol 2005; 288: H1461–H1467.
. Effects of hyperoxia on maximal leg O2 supply and utilization in men. J Appl Physiol 1993; 75: 2586–2594.
. Determinants of maximal oxygen uptake in severe acute hypoxia. Am J Physiol Regul Integr Comp Physiol 2003; 284: R291–R303.
. Cardiac output and leg and arm blood flow during incremental exercise to exhaustion on the cycle ergometer. J Appl Physiol 2007; 103: 969–978.
. Cerebral oxygenation declines at exercise intensities above the respiratory compensation threshold. Respir Physiol Neurobiol 2007; 156: 196–202.
. Zerebrale Oxymetric dürch Infrarot-Spektroskopie im Vergleich zür kontinuierlich gemessenen Sauerstoffsattigung im Bulbus Vena jugularis bei Eingriffen an der Arteria carotis interna. [Cerebral oximetry by infrared spectroscopy in comparison with continuous measurement of oxygen saturation of the jugular vein bulb in interventions of the internal carotid artery.]. Vasa 1995; 24: 168–175.
. Cerebral oxygenation monitoring: near-infrared spectroscopy. Expert Rev Med Devices 2006; 3: 235–243.
. Cerebral oxygenation during exercise in patients with terminal lung disesae. Chest 2002; 122: 445–450.
. Cerebral blood flow during exercise: mechanisms of regulation. J Appl Physiol 2009; 107: 1370–1380.
. Different blood flow responses to dynamic exercise between internal carotid and vertebral arteries in women. J Appl Physiol 2010; 109: 864–869.